I felt like Cinderella riding to the ball at the prince’s castle with my pumpkin carriage and footmen. Actually it was a rented Ford Expedition minivan with my family, but still the thrill was there. I’d always heard about the castles in Ireland and it had been on my bucket list for years to go see Blarney, Dromoland, and Cabra Castles, to name a few. Finally, I was going there in person to see them, touch them, and smell them, and enjoy every minute with them. As our carriage, I mean minivan, arrived at Blarney Castle near Cork, I nearly had goosebumps. It was more stunning than I ever dreamed. As we walked closer to the castle, we saw just how huge it was and thought about what a daunting task it would have been to build this magnificent structure in the 13th century. To me it seemed impossible, but, yet, there it was. As we climbed the seemingly thousands of stone stairs to the top floor of the castle, the answer became clear. “Of course! We can’t come all the way to Ireland, all the way to Blarney, and all the way to the top of this castle without kissing the stone.” Besides, if we do kiss it, we will be given the gift of great eloquence, the gift of gab, the skill of flattery. And more than ordinary flattery, this flattery is sweetened by humor and wit, much like the Irish people themselves. We finally get to the top of the castle. Breathing hard, we intrepidly approached the guard who was in charge of assisting people to kiss the stone. And you do need assistance. This is not a stone in the middle of a field that you can just skip up to and plant one on it. Oh no. You have to sit backwards on a stone ledge and lean backwards and upside down so your back is arched awkwardly and your head is lower than your bottom by about 24 inches, and grab onto metal bars that are attached to the stones that are now above your head. Dangling upside down, holding on to the metal bars for support, you can see the ground hundreds of feet below you. Finally you wiggle down to where the stone is. There it is, in all its glory, right in front of you, and you give it the kiss of your life! What a thrill! Just before you pass out from the blood rushing to your head, the guard puts his hand on your jacket and pulls you up. Feeling giddy and lightheaded, you struggle to get back to a seated position on the stone ledge. Wow, we did it. 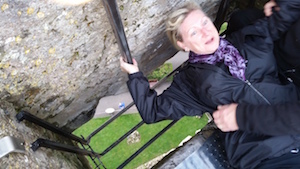 We kissed the Blarney Stone and lived to tell about it. High five! This is definitely one of the highlights of my trip to Ireland. I would do it again in a New York minute. For more information go to http://www.blarneycastle.ie/.